Lunch parties. For years I have cherished this vision about the perfect lunch party at my house: our friends and loved ones would gather around a long farm table in the backyard. The carcass of our basketball hoop laying by the grass would magically disappear and a large vase of ranunculus would garnish the peach colored tablecloth. Adults will be nibbling on marinated olives and muhammara dip, while the kids would be playing knights with cheese straws or, even better, eating them. The food, and I, would be ready well in advance and I won't have my hair still soaking wet from the last minute shower. Lunch would be casual and relaxed. Kids would be fed first and sent playing board games and puzzles on the shady deck, as we enjoy our lunch peacefully. (One can always dream!) Buzzing birds and laughter being our only background. I haven't gotten far enough in my fantasy to know what the menu would be like. Probably different kinds of quiche, my husband's favorite, certainly my famous apple tart and definitely a salad or two. I cannot conceive a menu without a salad. And the easiest course to think about, even when not daydreaming, is salad. The specimen you see on the picture is the salad I made last Saturday for a couple of friends. Though effortless in concept and ingredients, It was the highlight of the evening (the chicken wasn't bad either). All you do is cut the carrots diagonally, just to look fancy, and steam them until cooked but still firm. When ready, you heat some olive oil and add your parsley, garlic and the spice of choice for this salad: ground caraway. If you haven't tried the combination of carrots and ground caraway together, you owe it to yourself and to your carrots. Toss. Add the remaining olive oil, as the fruitiness of the olive oil changes when heated, and a drizzle of fresh lemon juice, a must, and you have a match made in heaven. The dreamy lunch may not be in my near future, but as long as there are carrots and this salad on my menu one can always hope. Steam the carrots until tender but still retain their shape. When the carrots are cooked, carefully remove the steaming basket and set aside. Meanwhile, heat 1 tbsp of olive oil in a small sauté pan. Add the garlic, ground caraway and parsley. Cook for one minutes stirring constantly until fragrant. Remove the pan from the heat. Add the hot carrots to the herb mixture and toss. Add the remaining 2 tbsp of olive oil and lemon juice and toss again. Transfer to a plate and leave to infuse for at least an hour. Enjoy the salad at room temperature. that is a wonderful day dream of a lunch and relaxing afternoon. Sound just like a sean out of a Jane Austin book. Your perfect lunch party is making me fantasize too. I'm starting to feel relaxed just from reading this. Wonderful carrot salad too. Caraway and carrots were meant for each other from the start. So simple, beautiful and obviously tasty. I'm looking forward to having a lunch or dinner party to serve these carrots, it's been too long. Sometimes I think my daydreams of lunches like these prevent me from actually having them, because I fear they won't be so perfect. Thanks for the reminder that impromptu dinners with chicken and carrots can be just as lovely, though! The dressing alone makes this a must to try . And it is a very pretty salad ! A very pretty salad presented so well that no one could resist taking a ladle and getting a serving! 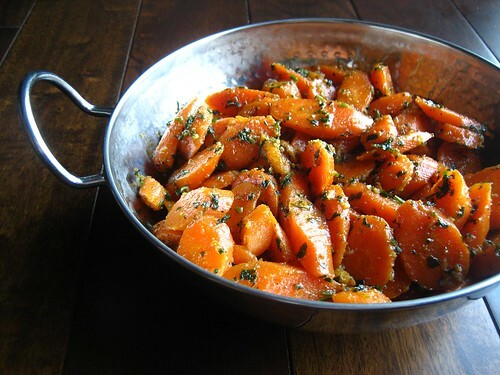 I have never tried caraway with carrots and it does sound like a very good pairing. Great picture and great dish! I have never tried caraway with carrots...I am going to have to sometime soon. I am a bit confused though. Is caraway the same as yansoon? Im sure you will let us all know when you have a book published with your vivid memories and beautiful pictures! Sounds good! I'm going to have to try this recipe. Nice picture. warda your site is immense and am going to be usuing it for some of my food tec coursework gcse i have to prepare this holiday. i have chosen magreb as my culture and have to make 10 dishes. im from algeria anyway but live in england. I really do love this recipe - it looks gorgeous and I can't wait to try it. Ihave seen so many versions of this salad and Imust say this is the first time Ifind one that is exactly the same as mine . Lamia, I love this salad and can never get enough of it.